Link to post on Fr. Z's Blog. 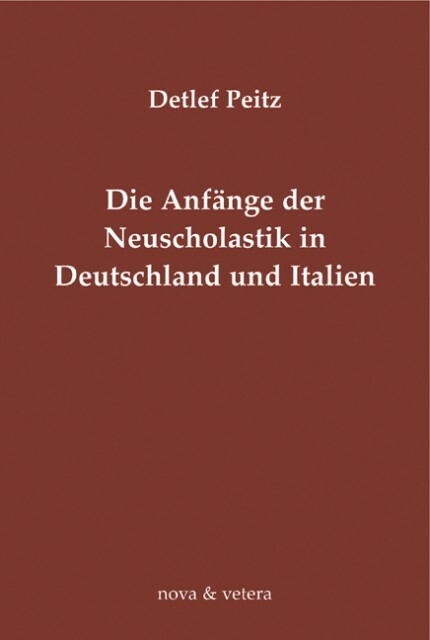 Detlef Peitz, Die Anfänge der Neuscholastik in Italien und Deutschland (“The Rise of Neo-Scholasticism in Italy and Germany”). Bonn, Germany: Nova et Vetera, 2006. This book tells the fascinating story of the rise of Neo-Scholasticism in Italy and Germany. Author Detlef Peitz’s doctoral dissertation from 2005 has been put in print, to the joy and benefit of all Catholic theologians and philosophers. Here we have a painstakingly and meticulously erudite work on an important episode in the history of Catholic theology and philosophy. 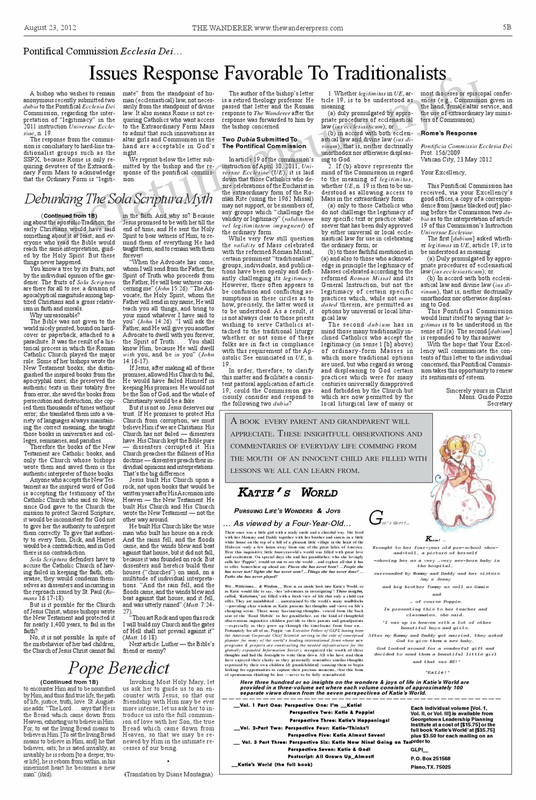 Sometimes the amount of information provided can be overwhelming, but it serves its purpose in telling this important story, which is crucial for understanding the theological conflict between modernists and traditional Catholics from the modernist crisis around 1900 up to the Second Vatican Council—and beyond, up to the present day. All the arguments currently offered by modernists and traditionalists were already laid down during the years from around 1840 to 1864 with the publication of Quanta Cura by Pope Pius IX. The Neo-Scholastics had an opposing force in the “The Tubingen School of Catholic Theology,” especially represented by the two dogmatic theologians Johann Sebastian von Drey (1773-1854) and Johannes Evangelist von Kuhn (1806-1887), who were heavily influenced by German romanticism and by the philosopher Friedrich Wilhelm Joseph Schelling (1775-1854). Another opposing school is that of the Kantian thinker, Georg Hermes (1775-1834), a professor of Catholic dogma at the Catholic theological faculty in Bonn. This faculty was set up by the Prussian government in 1818 in order to influence the Catholic Church and its clergy through enlightenment ideas. Another opponent in Italy who founded an order of priests was Antonio Rosmini, whose Psychologism became a point of attack upon the Neo-Scholastics. Anton Günther (1783-1863) was another theologian, heavily influenced by Kant and Hegel, who had quite a number of followers and who attacked the Neo-Scholastics. The book also sketches the importance of Catholic periodicals in Italy and Germany for the promotion of Neo-Scholasticism. The book is divided up into four long chapters: (1) The Paving of the Way for Neo-Scholasticism; (2) The Rise of Neo-Scholastic Works; (3) The Establishment of Neo-Scholasticism; and (4) The Main Points of the Neo-Scholastic System. Chapter One describes the painful rediscovery of Scholasticism in the wake of the Enlightenment, the French Revolution, and the tumultuous years of Napoleon after the Congress of Vienna. After the dust settled, there was time to reflect on what had happened in previous years. The doctrinal and philosophical heritage of Thomism was better preserved in the Dominican order than in the Jesuit order. The Dominicans not only followed St. Thomas as their official theologian, but saw him as the Doctor Angelicus and normative theologian of the Church, despite the breakdown of Scholasticism within Catholic philosophical and theological discourse since ca. 1650. Yet this heritage was preserved by thinkers such as Antoine Goudin, O.P. (1639-1695), Luduvico Cardinal Gotti (1664-1742), and Charles René Billuart, O.P. (1685-1757). The Jesuits were plagued by internal strife over which philosophical discourse to pursue. Older Jesuits were attracted to Enlightenment ideas, and the younger members of the Society favored the traditional Jesuit theology and philosophy of the Doctor Eximius, Francisco Suárez, S.J. (1548-1617), Luis de Molina, S.J. (1535-1615), Juan Martínez de Ripalda, S.J. (1595-1648), and Gabriel Vázquez, S.J. (1549-1604), but there was also some interest in rediscovering St. Thomas, a desire inspired by the Jesuit commentators of Aquinas. But individual theologians struggled with weeding out Enlightenment ideas, and some failed to do so. A seminary in Piacenza, Italy was founded ca. 1750 to promote Thomism. Later on, towards the end of the 18th Century in Mainz, Germany, the now-famous “School of Mainz” was founded, which achieved high renown for its promotion of Neo-Scholastic Thomism, despite its secularization in 1803 by the prince bishopric of Mainz during the Napoleonic years. The Roman School is also very important, due to its influence in promoting Neo-Scholasticism in Germany and Italy. The Roman School was situated at the Collegium Romanum. Its most famous theologians are Josef Kleutgen, S.J. and Matteo Liberatore, S.J. We shall take a look at these thinkers below. One of the first theologians to promote Neo-Scholasticism in Germany was Franz Jakob Clemens (1815-1862). He did not simply regress into the past and its problems and specific context, but used Thomism as a tool for dealing with the erroneous philosophical and theological ideas of his own time, e.g., subjectivism. His approach to theological problem-solving was praised by Pope Leo XIII in Aeterni Patris in 1879. Apart from the newly established seminaries in the “new Thomistic spirit” of the day, we also find periodicals such as Scienza e fede (Italy), Civiltà catolica (Italy), and Der Katholik (Germany), which promoted the revival of Thomism. In Chapter Two, Peitz presents Fr. Joseph Kleutgen’s Theologie der Vorzeit (“Theology of the Past”), published in 1853, and his Philosophie der Vorzeit (“Philosophy of the Past”), published in 1860. Because they were written in German, these two works obtained a relatively wide readership. Thanks to the philosophical and theological merits of these works, Neo-Scholasticism was redefined in Germany. In them we find a mixture of Thomism and Suarezianism. Anton Günter had criticized Kleutgen from the perspectives of modern philosophy and of the thought of St. Anselm of Canterbury, claiming that we have an immediate conscience of God. In these works, Kleutgen uses both St. Thomas and Suárez to refute Günter. Kleutgen defends Aquinas’ first way against the claims of Kant, Duns Scotus, and Suárez, and the second and third ways against the attacks of the traditionalists (Bonald, de Maistre), with the aid of Suárez’s thought. The fourth way is unfortunately not discussed in the book, but the fifth way is defended, along the lines of Domingo Báñez’s commentary, against the objections of Georg Hermes and Jakob Frohschammer. But as we shall see when we discuss the thought of Matteo Liberatore, it is quite a difficult task to reconcile together every scholastic tradition. Suarezianism and Thomism in particular do not easily reconcile together. Kleutgen, thus, received much criticism for attempting this reconciliation. Hermann Ernst Plassmann (1817-1864) was the first of the Thomists of the “strict observance” in the modern period. 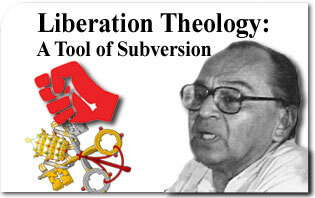 He was profoundly influenced by Fr. Antoine Goudin, O.P. in his approach to Thomism. Although he was a Jesuit and professor of theology at the Roman university of La Sapienza, he later obtained another degree in theology at the (Dominican) College of St. Thomas in Rome (the Angelicum) and is for this reason presented thereafter as a graduate of the Angelicum. His main Thomistic work is titled Die Schule des Heiligen Thomas von Aquin (“The School of St. Thomas Aquinas”), in 5 volumes (Vorhalle, Logik, Psykologie, Moral, and Metaphysik), perhaps the most important Thomistic work of the period in Germany. For what has been considered to be a very polemical work, Plassmann did not get good reviews, mainly due to his tone; but that aside, it is a profoundly Thomistic piece of writing. He follows St. Thomas very closely in all his theological and philosophical arguments (e.g., hylemorphism), but does not fall into the trap of dealing with the problems of the past, but directs his critique at his contemporary opponents inside and outside of the Church. There is no going back and forth between the Suarezian and Thomistic camps. His is a pure, unadulterated Thomism. The third important philosopher and theologian is Fr. Matteo Liberatore, S.J. (1810-1892). Liberatore was first influenced by Immanuel Kant at the beginning of his intellectual career, and he even writes against Thomism in his Institutiones Logicae et Metaphysicae (1840-42). There, he takes a stance against Thomistic dotrines such as hylemorphism and, in particular, against the thesis that the soul is the form of the body. In the early 1850s, however, he begins to turn towards Thomism, thanks to the periodical Civilta Catolica. He then rewrites his Institutiones Metaphysicae and Elementi, strikes anti-thomistic passages, and throughout the rest of the decade gradually becomes a Thomist. In his work, Della conoscenza intellettuale (“On Intellectual Cognition”), published in 1857, he defends, among other Thomistic doctrines, the principle of non-contradiction against Kant and Rosmini (and his followers), the latter of whom had argued for a distinction, if not a separation, of ideal and real worlds. But Liberatore’s own argument is somewhat flawed, because, among other things, he identifies essence with nature, and thereby blurs the real distinction between inner and outer worlds. From this we can see that he also stands in the Jesuit-Suarezian tradition. He does not distinguish between ens and essentia in extramental objects. They are the identical in extramental objects, and are distinct only in the mind. He somewhat follows the Suarezian critique of the five ways of St. Thomas Aquinas, but makes a compromise and ultimately reduces them to three ways, with the following three distinct starting points: (1) the relation between cause and effect, (2) the removal of the incompleteness of creatures, and (3) the eminence of each creature. How does this connect with his Thomistic aspirations? Liberatore never answers this question. He was, therefore, criticized for taking a middle ground between Thomistic and Suarezian positions. His later psychology is also an eclectic blend of Thomistic hylemorphism—with its definition of the soul as form of the body at the forefront—together with other Platonic and Augustinian elements. The third chapter of the book discusses the dissemination of Neo-Scholastic thought. In this chapter, the author presents some lesser-known, yet important theologians from the Jesuit and Dominican traditions, such as Matthias Josef Scheeben (Cologne, Germany), Thomas Maria Zigliara, O.P. (known for his Summa Philosophica), and Constantin Schätzler. These authors did much to popularize the thought of the theologians discussed in the previous chapters. Chapter Three also discusses the works of other Neo-Scholastics such as Karl Werner, who dedicated his career to the history of theology, as well as Alois Schmid, who attempted to reconcile Neo-Scholasticism and modern philosophy. The fourth and last chapter deals with Neo-Scholastic philosophical and theological issues. I shall limit my discussion to two topics, one in philosophy and one in theology. The first, philosophical topic is the concept of ‘being’ as a metaphysical foundation. 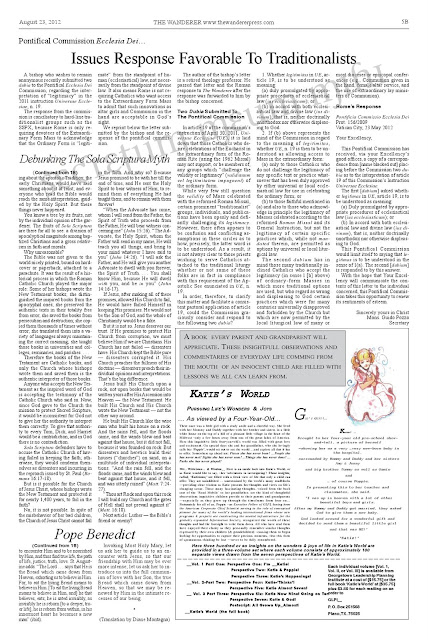 This issue gives us a good sense of what is distinctive in Hermann Ernst Plassmann’s Thomistic notion of ‘being’. Plassmann is convinced that in Aquinas we have the ultimate metaphysical conception of ‘being’. In things themselves, he affirms, there is a real distinction between ens and essentia (existence, or being, and essence). Likewise, this is also a distinction between form and matter, and act and potency. But matter does not in itself possess act. In itself it is pure potency. Thus, being is the ultimate reality. This encompasses not only sensible reality but also possible reality. Yet, can one extend this notion of ‘being’ ad infinitum? Both Plassmann and Kleutgen deny this explicitly. It follows, then, that ‘being’ is not a univocal concept. It would seem to be an ambiguous, or equivocal concept. If so, it would be very difficult to distinguish between the different types of beings. But one must remember that ‘being’ is not a genus, and thus Plassmann uses the concept of analogy to understand and make explicit the concept of ‘being’. Being appears in different contexts, and thus there is a tension between act and potency. Plassmann turns to the Thomistic real distinction between being and essence to resolve the issue, whereas, as we have seen, Kleutgen and Liberatore turn to the Suarezian doctrine of the distinction of being. Furthermore, Plassmann posits another distinction, that between subsistence and existence, because neither form nor matter is, but only the “supposit” is, and things have not being in themselves, but participate in being. The theological concept that I think deserves mention is the relation between the act of faith and grace. This has to do with the classical questions of whether (and how) man’s natural abilities contribute anything to the act of grace, and how supernatural grace relates to the human mind. Kleutgen emphasizes the connection between faith and credibility, whereas Plassmann demands a strict distinction between them. Faith must not be “of necessity.” Faith is not something formal, but is grounded in the divine and objective act of grace (cf., Scheeben). The supernatural character of the faith is important as well. The content of faith has a divine origin, pace Von Kuhn, for whom faith originates in man himself. Kleutgen agrees that faith has its own principles and that it is a higher knowledge of all things. In this sense, faith grounds theology as a new science, from where everything proceeds and to which everything returns. Kuhn also understands the term perficere to mean the continuing perfection of man, his being able to improve, rather than conceive it according to its proper meaning, as an elevation of man to the divine order. Kuhn claims that the classical natural-supernatural distinction risks setting the stage for a mechanistic conception of grace. Constantin von Schätzler answers by denying this and accuses Kuhn of being a Molinist: it is only a danger if grace is turned into a mechanistic contraption, as if grace were of a worldly, human origin, and as though it proceeded automatically from nature to a supernatural level of being. In the end, one must say that Detlef Peitz has made a monumental contribution to the history of philosophy and theology through his narrative of the beginnings of Neo-Scholasticism in Italy and Germany. One thing must be said concerning the setting of the book. At times the words are written together, without spaces between them (likethis), perhaps in order to save space, which is, to state the obvious, quite annoying. Peitz’s overall assessment of the Neo-Scholastic movement is very positive. In his view, one of the causes of the decline of Neo-Scholasticism—besides the Latin manuals and the widening gap between modern science on the one hand, and theology and metaphysics on the other—was its being too sure of itself, a phenomenon that has happened within many other movements. Not much could be done about this, of course. But what can be done today, and is not being done, is to present Neo-Scholasticism in a positive light in Catholic seminaries and theological institutes around the world and to consider seriously whether it could represent a better way of doing theology and philosophy in the Church. (Of course it is!) The “anthropological turn” in philosophy and theology has been an utter disaster for the Church, because theology and philosophy are seen as something that originates within man. This also makes the new theology vulnerable to Feuerbach’s critique. The natural sciences and society at large have turned their back to religion and Scholasticism. This is lamentable, because the Catholic faith and Neo-Scholasticism still have many things to offer with regards to the assessment of the natural and supernatural worlds. This is true for biology, nuclear physics and theology itself. Absurd: A "Revised Traditional Missal," As Opposed to a "Traditional Traditional Missal"? Revised Traditional Missal Planned for Next Summer in Rome? Link to CFN News article.